Life here is finally starting to be complete. I am no longer waiting for classes to start, waiting to hear back about English classes, waiting for information about my internship, it’s all over. Now, everything has begun. I’ve given my first private English lesson, I’ve started classes at the university, and my internship is going great. Yet it’s living in a different “country” that seems to be the only thing that is difficult for me. When you try your hardest for so long to become fluent and culturally acceptable in one place and you pick everything up to start anew in a different region of that same country, but suddenly everyone there hates where you come from, it’s a little difficult to feel like you’re at home. As Americans, we think of September 11 as a day of mourning. The Catalans see it as a day of change. It is the Diada de Catalunya, which is their day to fight for their independence from Spain. There have been long-standing conflicts between the capital (Madrid) and the region of Catalunya which is where I now live. They speak Catalan, all the signs around town are in Catalan, it’s even illegal to put something up on your shop or restaurant in Spanish without having its Catalan counterpoint. You could put everything in English and it be perfectly fine, but you can’t have Spanish without Catalan as well. The Catalans have their own traditions, which I got to see first hand as this week, the entire region shut down for “holiday” to protest their supposed oppression from the Spanish capital. 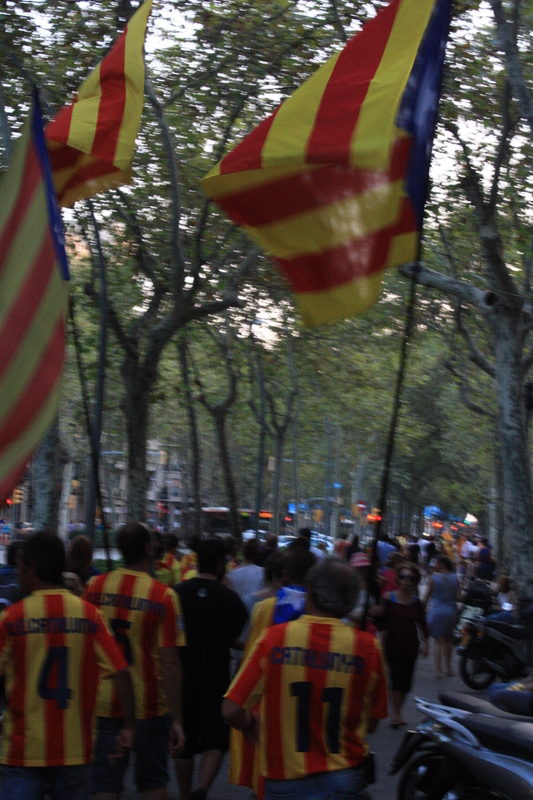 I saw hundreds of people wandering the streets wearing Catalan flags, painting their faces in Catalan colors, and them chanting unintelligible (to me) words for Catalan independence. It took me until this week to really realize the extent of Catalonia-ism. I met a guy at my university who is from a small town in Catalonia who could barely speak Spanish. He told me that he in no way feels Spanish, and I can tell you that my Spanish was probably better than his. And he has lived in Spain his entire life. But Spanish culture had no effect on who this guy was. He was completely Catalan. Even when he spoke in Spanish, he had an incredibly thick accent, unlike one I had ever heard. He struggled to express himself in Spanish and I found that so strange. But that’s when I realized that maybe parts of Catalunya really aren’t Spain. Politically Spain and Catalunya are part of the same country. But when you see that they speak their own language, have their own traditions, have their own culture, I’m starting to really feel like I live in a different country. It’s hard for me to identify with this whole Catalunian business to be honest. I am from Madrid. I feel like I am from Madrid. My Spanish is from Madrid. My “accent” is from Madrid. But I am in Catalonia where they hate Madrid. Even my American boss will hint at what the Catalonians call “Spanish oppression.” My boss sent out an email to everyone saying that there wouldn’t be work last Monday because of the Diada de Catalunya. In my boss’s email, he said the office would be closed “to commemorate when your people in Madrid stole away our autonomy.” And he’s American. You can see he’s been living here for a long time. But that’s the sentiment that strongly exists here. That’s difficult for me to handle. First, I’m not from here so I have no personal attachment to their desires to become independent. Second, I am Spanish. I identify with Spain. My friends are Spanish. I speak Spanish. My life has been centered around Spain and Spanish for years. I have lived in the capital of Spain for two years. And that’s where I call home here in Spain. I’m a foreigner, but now I’m more so of one. In Madrid, I always felt like I was one of them. I identified with them, I went out with them, and we became amazing friends. I learned their language and their culture. And now I have to do it again in a place that is supposedly in the same country. It’s a strange division that is really felt here. Even in my classes, there are a few Catalans, but so far they haven’t said anything too radical. In fact, they really are very nice. But there is this Welsh guy who is obsessed with the independence movement. He can identify with it on a personal level since Wales has almost always been under English rule. They want the same things there as the Catalans do here. Even he has started to call me Madriz, with the overly-forced accented “-th” sound at the end just like a true Madrileño would pronounce it. For me, I just can’t get on board with this whole thing. At the same time I totally understand what they want, but I just can’t find any bit of connection to it. Which is quite unfortunate because it seems to be such a prominent part of their lifestyle and culture. Even at the stores and on houses, you will not see a single Spanish flag. They either fly the Catalan flag or their flag of independence. But it’s not whether I’m on board or not. I understand their schism and their frustration. I’m now seeing that they are truly a different people. Economically, they’d be fools to break from Spain (I think), but I don’t see anything wrong with them becoming their own nation. One can see their true differences from Spain, and one can hear how badly they want to separate, why not just let them? 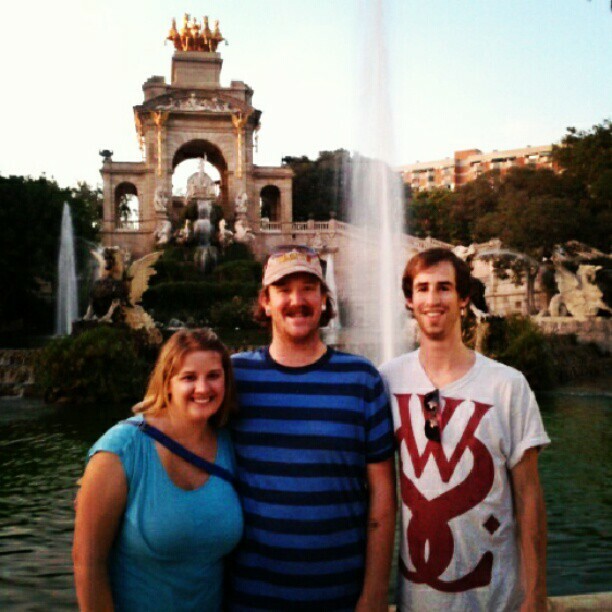 On a positive note, I’m making lots of friends, and apart from the political and cultural barrier, life in Barcelona is terrific. The weather is great, the beer is always cold, the beach is just a few minutes away, and it’s aesthetically stunning. I do really love this city. I couldn’t be happier to be here right now. As for my future and for my career, moving here has been the best decision I could have made; I’ve said it before and I’ll say it again. I’ve already started making new friends at my university (you wouldn’t believe some of these peoples’ backgrounds, all multi-lingual, multi-nationals. Makes me jealous that I’m the only guy in the program that speaks a mere two languages.) But everyone is really great. My classes so far are just introductory ones for people who haven’t studied international relations before. The political theory class is great, but I’m drowning in the economics one. It’s taught in Spanish, first of all, and then on top of that, I don’t even know what any of the terminology means in English. Plus, we’ve had to do some calculating of GDP stuff and I don’t even know how to write out the right equation, let alone solve it. Hopefully I don’t have to take too many economics courses with this master’s. I think I’ll stick to politics. The internship is going well. I’m in charge of making videos and taking pictures which will be a lot of fun. I haven’t had much of chance to work in the past two weeks, but once we get a good outline of what we are going to do, I’ll start filming and editing and designing and I’m really looking forward to it. It was definitely an adjustment for me too when I came to Galixa (jaja) after studying abroad in Madrid. After living in Puerto Rico, Galicia, etc. I’m starting to see that while politically an area might pertain to another country, in every other aspect, you’re on a different planet. After a while, I would get excited about going to Sevilla or Madrid because I’d be going to “Spain”. It can definitely be difficult though when you make friends with extreme nationalists or people who really don’t speak castellano and seemed to think “this stupid guiri who doesn’t realize she’s not in Spain”. But hey, I guess it’s part of the package? Because your identity is puro madrileño, and has been so for a while now, it might be harder for you to assimilate in Catalunya, unless you find that connection and really want to. Hence, why my Spanish remained fairly Puerto Rican despite living in Spain, because my identity here was too deeply engrained in me to change severely.